Plants annual. Culms 10-100 cm, not swollen at the base. Ligules 5-12 mm, truncate to rounded, often lacerate; blades 3-15 cm long, 2-10 mm wide, smooth, shiny. 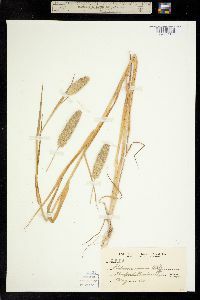 Panicles 1-8 cm long, 1-2 cm wide, dense, ovoid-lanceoloid, truncate to rounded at the base, rounded apically, the spikelets borne individually, not clustered. Spikelets homogamous, all spikelets with a bisexual floret; florets 2; disarticulation above the glumes, beneath the sterile florets. Glumes 4-6.5 mm long, 1.2-2 mm wide, keels winged distally, wings 0.3-0.5 mm wide,irregularly dentate or crenate, occasionally entire, varying within a panicle, lateral veins conspicuous, smooth; sterile florets 1, 0.7-1.8 mm, linear, glabrous or almost so; bisexual florets 2.5-4 mm long, 1.2-1.8 mm wide, pubescent, dull yellow when immature, becoming shiny gray-brown at maturity, acute to somewhat acuminate; anthers 1-2 mm. 2n = 28, 29. 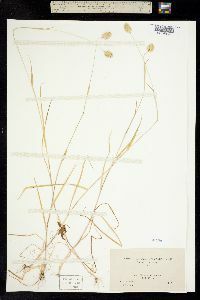 Phalaris minor is native around the Mediterranean and in northwestern Asia, but is now found throughout the world. Even where it is native, it usually grows in disturbed ground, often around harbors and near refuse dumps. 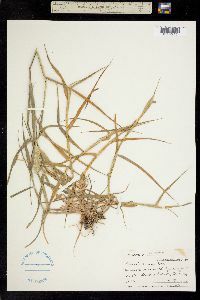 Although it has been found at numerous locations in the United States, it is only established in the southern portion of the Flora region. The compact panicle with its truncate to rounded base and the rather variable edges of the glume wings usually distinguish Phalaris minor from other species in the genus. Annuals, Terrestrial, not aquatic, Stems nodes swollen or brittle, Stems erect or ascending, Stems geniculate, decumbent, or lax, sometimes rooting at nodes, Stems caespitose, tufted, or clustered, Stems terete, round in cr oss section, or polygonal, Stem internodes hollow, Stems with inflorescence less than 1 m tall, Stems, culms, or scapes exceeding basal leaves, Leaves mostly cauline, Leaves conspicuously 2-ranked, distichous, Leaves sheathing at base, Leaf sheath mostly open, or loose, Leaf sheath smooth, glabrous, Leaf sheath and blade differentiated, Leaf blades linear, Leaf blades 2-10 mm wide, Leaf blades 1-2 cm wide, Leaf blades mostly flat, Leaf blades mostly glabrous, Ligule present, Ligule an unfringed eciliate membrane, Inflorescence terminal, Inflorescence a dense slender spike-like panicle or raceme, branches contracted, Inflorescence solitary, with 1 spike, fascicle, glomerule, head, or cluster per stem or culm, Inflorescence densely corymbose, paniculate, or capitate, rays reduced or absent, Inflorescence spike ovoid, lanceolate, or oblong, not more than twice as long as wide, Inflorescence single raceme, fascicle or spike, Flowers bisexual, Spikelets pedicellate, Spikelets laterally compressed, Spikelet less than 3 mm wide, Spikelets with 3-7 florets, Spikelet with 1 fertile floret and 1-2 sterile florets, Spikelets solitary at rachis nodes, Spikelets all alike and fertille, Spikelets bisexual, Spikelets disarticulating above the glumes, glumes persistent, Rachilla or pedicel glabrous, Glumes present, empty bracts, Glumes 2 clearly present, Glumes equal or subequal, Glumes equal to or longer than adjacent lemma, Glume equal to or longer than spikelet, Glumes keeled or winged, Glumes 1 nerved, Glumes 3 nerved, Lemma coriaceous, firmer or thicker in texture than the glumes, Lemma becoming indurate, enclosing palea and caryopsis, Lemma 5-7 nerved, Lemma body or surface hairy, Lemma apex acute or acuminate, Lemma awnless, Lemma margins thin, lying flat, Lemma straight, Palea present, well developed, Palea about equal to lemma, Palea longer than lemma, Palea 2 nerved or 2 keeled, Stamens 3, Styles 2-fid, deeply 2-branched, Stigmas 2, Fruit - caryop sis, Caryopsis ellipsoid, longitudinally grooved, hilum long-linear.